Red Sox President Sam Kennedy took a commercial flight from Las Vegas to Boston Thursday. And no matter how any gamblers on board did at the casinos, they were lucky to be on that plane. 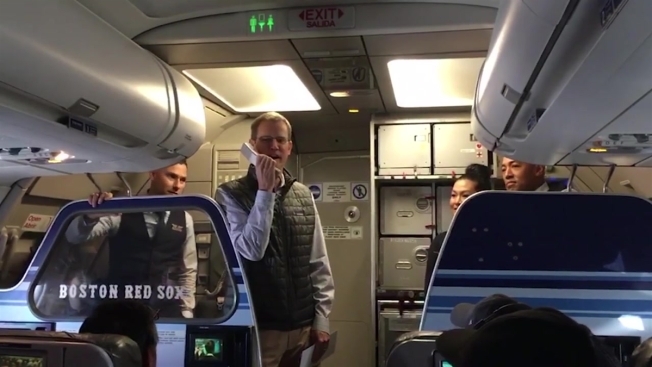 Kennedy announced over the PA that everyone on the JetBlue flight was receiving two tickets to see the Sox play the Tampa Bay Rays at Fenway Park on April 15. "You may have noticed when you walked onto the airplane today there was a Red Sox logo on the tail," Kennedy told passengers. "We have launched a promotion called #TheGiftOfSox." The flight erupted in applause after the announcement. Kennedy also praised President of Baseball Operations Dave Dombrowski for his flurry of moves at the Winter Meetings, headlined by the acquisition of ace Chris Sale. "We're excited about 2017," he said.